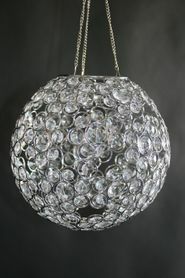 Home > Lighting > Chandeliers > Chandeliers - Round Spheres > Chandelier "Ayanna" Sphere - Large 20" Diameter (Or Use On Tables!) - Transformers 3 Movie! Our Ayanna chandelier ball at ShopWildThings was the choice of set designers for the popular movie Transformers 3 AND for the Primetime Emmy Awards 2015! 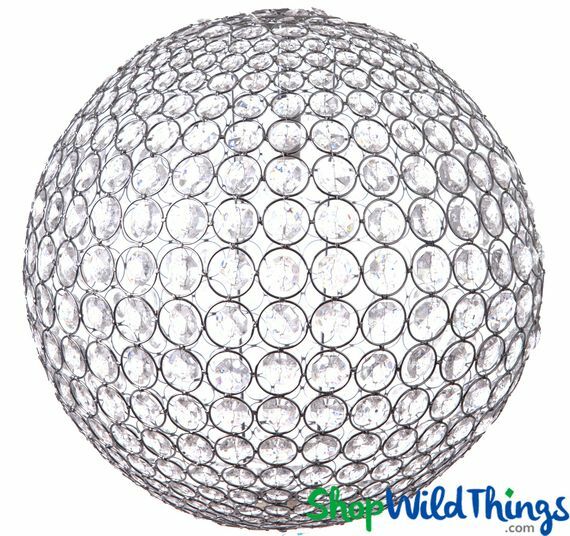 This large sphere-shaped chandelier will be perfect for your parties or stage sets, too. 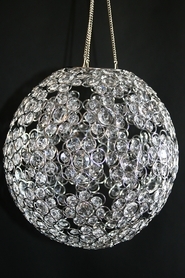 It's 20 inches in diameter and covered in faceted crystals. The hanging chain is 12 inches. Hang it anywhere, or flip it over and place on a table for a dazzling centerpiece. The opening at the top is 5.75 inches. Click on our video below to learn how to insert one of our light kits inside your hanging round chandelier. Visit our lighting pages for links to LED light disks and Standard Light Cord Kits you can use with the Ayanna chandelier. It's an oversized item, so it's not eligible for our free shipping. Lights are not included, but the center of the chandelier already has the hardware to hold a standard light kit or earth-friendly cordless LED light disc in place. 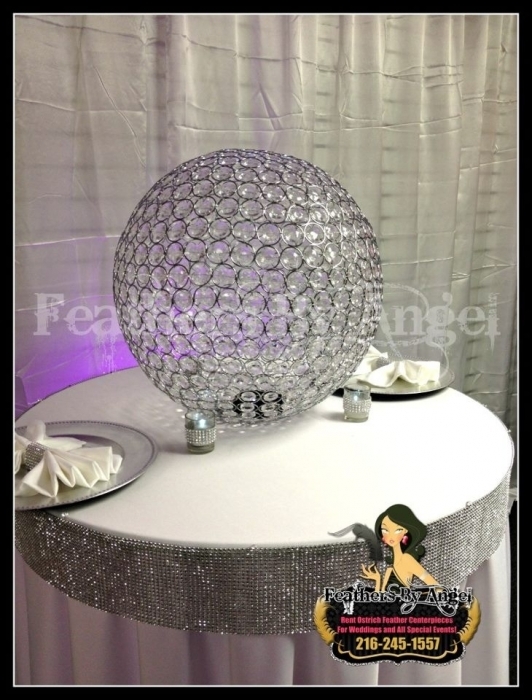 Read all the rave reviews about this beautifully made chandelier that is decorating movie sets, galas and outdoor pavilion events. See our Event Planning page for some of the big names in show business that consistently turn to us as the trusted supplier of superior event lighting, backdrops and decor. This fabulous Chandelier weighs about 7 pounds. This is a quality made item. Once lit up its amazing. Bigger than what I thought it was compared to the photo, but just perfect for our clients. Will definitly give the wow factor for clients guest! Merchant Response:Thank you so much for the great feedback! Having creative and kind customers like you is what keeps us going strong! ProsFirst off love doing business with you guys! Its always the best experience. Super fast shipping. Correct things immediately! Thank you for offering great products. Also love my stow away! We keep one in my car since our company drives alot for business. Its like our duck Angel to get us our destination safe and sound! Wow!!! When I took it out of the box I could believe how large it was. Perfect for My event.